Back in the day, New York City had several teams that used to compete with the Big Boys, notably Columbia, Fordham and New York University. The latter teams had such a following that their games were often played at either Yankee Stadium or the Polo Grounds, as was the case in this game. 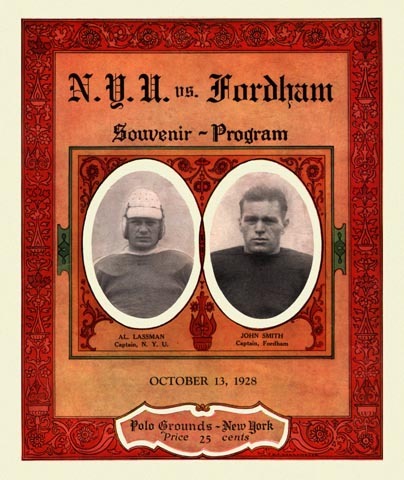 And while the Violets handled the Rams rather easily this time around, from the next year all the way up through World War II Fordham was one of the top football programs in the country, playing a tough national schedule and winning about 85% of their games.